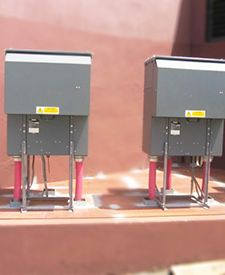 Original 13.8 KV installation at our client's power generating station, incorporated a single 13.8KV switchboard fed from a single 34.5KV system. This system was originally designed for 4 generating units, in the 1980s, and our client has since expanded plant capacity relying on the original design. The client required increased reliability and maintainability of its generating plant 13.8KV power distribution by adding equipment and supply source redundancy. The design includes a ring installation of "A" and "B" supplies to each critical load, selectable by operations. This feature not only allows for security of supply, but also allows for isolation of switchboards busses for maintenance and testing. 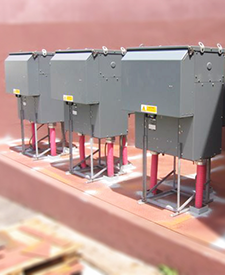 Customized modular switchgear enclosure, complete with Air Conditioning and fire protection / suppression manufactured by Northwest Electrical Services. Updated microprocessor based protection relay systems with coordination and communications using fiber optics IEC 61850 standards and PLC's communicating via IEC 61850 protocol.